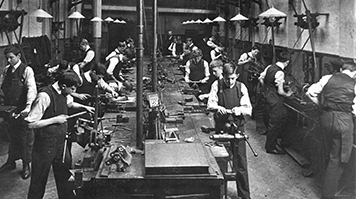 London South Bank University (LSBU), which began as Borough Polytechnic Institute in 1892, is celebrating an impressive milestone and wants to hear from past and present students, staff and LSBU community members to inform a creative record of the influence of the University in the years since its inception 125 years ago to now. LSBU Vice-Chancellor Professor David Phoenix said: “We have a number of events planned throughout the year to celebrate the anniversary, however LSBU would be nothing without the individuals who have contributed over the many years to our institution, be it as a student, in a staff role or the wider community. As one of London's largest and oldest universities, since 1892 LSBU has been providing vocationally-relevant, accredited and professionally recognised education which transforms lives, businesses and communities. “I left London in 1962, but in the intervening years gave back to the Polytechnic by lecturing at evening classes and still feel the warmth of having enjoyed my engineering based on sound teaching,” the letter stated. In another letter, a former student described their career spanning interesting and varied titles such as fighter pilot, weather forecaster, teacher and inventor as “achieved from a grounding at the Borough Polytechnic, now LSBU”. Has LSBU had an impact on your life? Share your story. Email press@lsbu.ac.uk or send letters to Press team, Marketing and Communications, 103 Borough Road, London SE1 6LN.